Welcome to the home of Robert, Rosie and their friends. 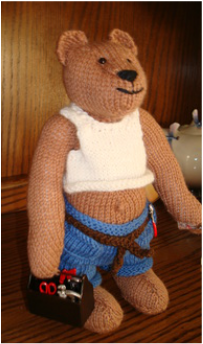 Each one unique and hand knitted with love for you to give or treasure. If they wear an outfit, the colour choice is yours. Wise old bear with glasses. 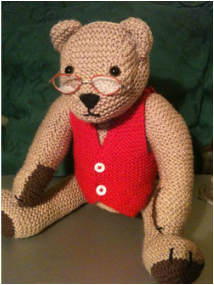 Soft jointed bear with glass eyes, removable spectacles and a waistcoat in your colour choice. 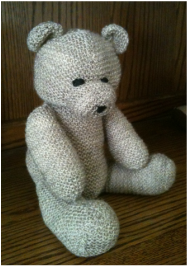 Knitted in soft yarn with new hygienic filling. NOTE: Robert is not suitable as a toy for small children due to small parts and glass eyes. Rosie has glass eyes and whole wardrobe of dungeries. Choose your own colour. 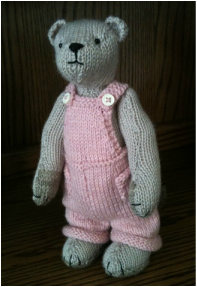 NOTE: Rosie is not suitable as a toy for small children because of the small parts and glass eyes. 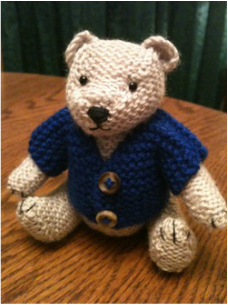 Can be made to order with embroidered eyes and without buttons. Peter comes with his own tool box and a selection of tools. Knitted in soft wool with new hygienic filling. ​Very soft and always ready for a hug. Embroidered eyes, suitable for small child. Baby Oliver keeps warm in his cardigan. You choose the colour. Poor James, he has lost a couple of toes and is looking sad but he has a warm heart. NOTE: James is not suitable as a toy for small children because of his glass eyes (Can be made to order with embroidered eyes).